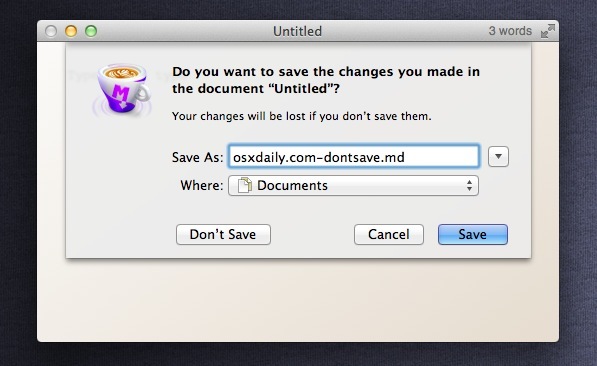 Mac OS X has rearranged the “Don’t Save” keyboard shortcut that shows up in the save dialog windows, moving from the longstanding Command+D to Command+Delete instead. Presumably this was done because Command+Delete (backspace) makes more sense and it’s harder to make a mistake, but some habits die hard. This change was first introduced in Lion, but it persists with other versions of OS X too. Realistically, if you haven’t noticed the change, this is one of those defaults write commands that there isn’t any reason to mess with. To be consistent, Apple should have changed the “Don’t Save” button to a “Delete Changes” button, and the “Save” button to “Save Changes”. Hey, Apple, what happened to your famous attention to details? Add this to your rules: “Whenever possible, the name of a button should hint at the keystroke equivalent”. Command + D switches the working directory to the user’s desktop when saving or opening. They also seem to have gotten rid of tab-to-focus in all standard dialogs. Also, where did the secondary choice button highlights go? The secondary choice was always circled in blue. You pressed enter for the default choice and space for the secondary. Once you learned that, it was one of the coolest features of OSX. Harvey, it sounds like you had “Full Keyboard Access” turned on in the Keyboard preferences in System Preferences, but have it turned off now. Go to Keyboard preferences, then choose “All controls” under “Full Keyboard Access” to get back that feature. The code for changing the shortcut doesn’t work anymore after I have updated with the latest operating system update. Could you provide at new code that works with this lates os 10.7.2 update? You people must have a different version of Lion than me, ’cause cmd+D still works as in previous Mac OSes. Only way cmd+D works to give desktop as place is if the “choose a save location” dialog is open in the expanded view. Command+S works for Save so Command+D SHOULD logically be Don’t save because of the first letter. Command+D to switch to desktop does not work consistent with the other “go to foler” -shortcuts. For example Command+H hides the app. Apple has made some really weird UI decissions lately and they totally messed up this one. Hope this is not going to be too much of a habit for them. Exactly my thoughts. Do you know if there is a trick to change the shortcut back to CMD+D? The command given here no longer works in 10.9 “Mavericks”. I just upgraded from 10.6.8 directly to 10.9 and… man, I’m running into these stupid usability changes all the time. There are so many things that Apple has removed or made more complicated over the last few years, I’m honestly amazed by their thought process (if I understood it). I mean you cannot even select text in the mac app store. Like what? SERIOUSLY APPLE? Incredible. The command prompt fix listed here doesn’t work, sadly. I miss the old Cmd-D also because it was a single hand operation. What’s worse is that this change appears to be dialog specific – my copy of Office 2011 still uses the old, Cmd-D dialog! I can’t believe that the change isn’t global. Absolutely unbelievable. If you go to Settings > Keyboard > Shortcuts, there text at the bottom that says “Full Keyboard Access: (…)”. Under that select the “All controls” option. It doesn’t restore the CMD-D shortcut, but it allows you to tab through options. And “Don’t save” is initially highlighted, so all I need to do is hit the Spacebar to select “Don’t save”. Now it’s only a thumb maneuver rather than a multi-key shortcut.